Do you need a great calendar for the year! 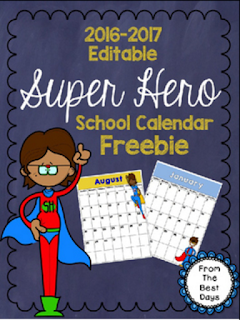 Are you in a SUPER mood for a SUPER school year? This FREE Super Hero Calendar will keep you going all year long! You can find it at my store, The Best Days! While you are there, click the GREEN STAR and follow me! You can also find me on Facebook and Pinterest! Fly on over and check out my blog too!